Don't you want to work from the couch? Let’s face it, we’re at a computer all day, and sometimes it’s nice to just work from the couch, at a coffee shop, or even knock out a couple of sketches when you travel. You’re not just going to use paper like a caveman, right? We’re digital connoisseurs! We need our screens and our undo commands! Well, you’re in luck. In this article we’re going to discuss what your options are for doing some digital penning on the go. We’ll go through the various apps that artists are using now and the specs of each of the styluses, so that you can decide what might be best for you. Pressure Sensitivity: This just refers to how many levels of pressure the stylus has. It’s kind of arbitrary, but you just have to know that the higher the number, the lighter you will be able press down and still make a mark. Latency: This refers to the time between you pressing the stylus on the screen, and the tablet actually showing a mark. It’s usually really hard to even notice, but with slower devices it’s much more obvious. Apple might not be on the forefront of pushing new technology as of late, but you can’t argue the fact that they helped popularize tablets with the initial launch of the iPad. Over the years artists have sketched on iPads with third-party styluses like the Bamboo Fineline 2, from Wacom, until Apple announced their first proprietary stylus in 2015 with the launch of the iPad Pro. Drawing on the iPad Pro is buttery smooth with the soft rubber tip on the pen and the usual glossy surface of the iPad. While Wacom was the premium drawing tablet for artists for years, a lot of people are switching to the iPad Pro for the convenience of being able to draw on the go.The weight and size of the stylus feels good in your hand, and you might even forget it’s there. The stylus should last you a very long time, but should you run low on battery, you can jus remove the cap on top of the stylus and plug it into the bottom of the iPad. While this does come in handy, it does make your iPad look a bit odd with a stiff tail hanging out the bottom, but luckily the pen does charge pretty quickly. There are handful of awesome apps that can allow to you show off your drawing prowess. The running favorite among artists is Procreate, which is mind blowingly powerful for an iPad app. It has more than a handful of useful features that makes it almost easier to draw in than most desktop applications, and even does this awesome “timelapse feature”. If you want to brush up on your hand-drawn animation, there’s a pretty nice app called Rough Animator that is basically just like using Flash. There’s also Animatic, which can even export GIFs and PSD files to continue your animation. It comes in handy if you want to do a couple of rough animations and then polish it up in something a bit more powerful on your computer. You might be asking, “Well, how would I do that?”. If you’re accustomed to Adobe’s Creative Cloud, you’re going to have to lug around an extra device. Luckily, the iPad Pro is chock-full of killer apps. For example, Astro Pad allows you to connect your iPad Pro to your Macbook and use it as a secondary display. There are two versions of the app that allow you to connect to your Macbook via USB or wirelessly, and it works pretty flawlessly, even enabling you to use touch controls for keyboard shortcuts. Lugging around a laptop and an iPad Pro isn’t quite as portable as one would hope, but at least you can get a heck of a lot of work done before needing to connect the two. As motion designers, we sometimes need the power of a full computer. Well you’re in luck, this is exactly what Microsoft has been pushing with their Surface devices. 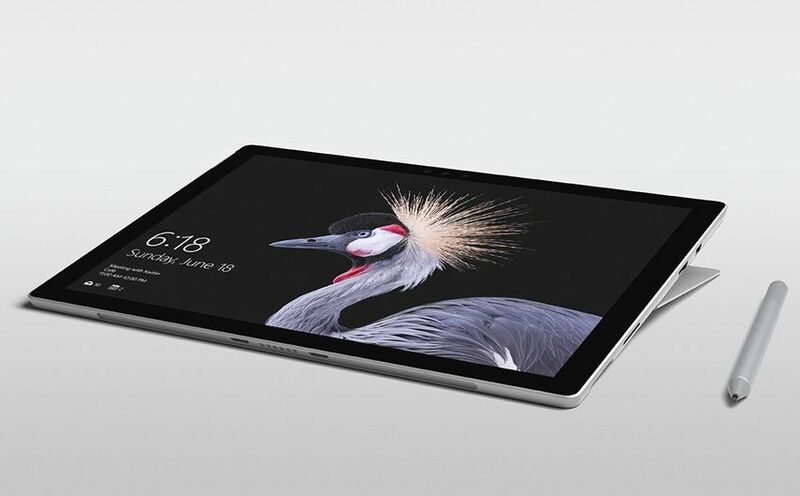 There are 4 different options when it comes to the Surface line, but we’re going to go over the main two portable devices; The Surface Pro & The Surface Book. If you’re used to Mac OSX, moving over to Windows might sound a bit scary, but the Surface devices are every bit as polished as a Macbook, and have a few more useful tricks up their sleeve. The Surface Pro & Surface Book are pretty much the same thing, except the Pro is more of a tablet computer, with a built-in kickstand. The Surface Book is laptop where you can detach the screen the from the keyboard base. These devices have been around for several years and have drastically improved since their initial launch. Imagine having a tablet that can also work as a full PC that’s able to run all of your favorite software. It’s an All-In-One computer tablet, which makes it a lot more travel-friendly, and they come with a sturdy kickstand built into the back that allow you to tilt the tablet down and be able to draw more easily. The pen, which works surprisingly well, snaps to the left side of the computer with a strong magnet, making it much harder to forget your stylus at home. For artists, we also have a few more options with this pen. There’s a button on the side of the pen, which is defaulted to right-click, and an eraser on top which also doubles as a programmable button. A lot of artists would rather use the keyboard to switch to the eraser tool, but using the eraser on top of the Surface Pen actually feels really great on the screen. In addition, for a few extra dollars you can purchase a nib kit for your pen, which allows you to swap out the nib on the tip of the pen to suit your comfort and preference. Like the Apple Pen, the battery life of this pen should last you several months, but should you need to give it some more juice, you can pop off the top and replace the two AAAA batteries inside. Drawing with the stylus works surprisingly well, and it’s fun to be able to navigate Windows 10 with it. The rubberized tip on the pen and the less-glossy screen on the Surface provide a bit more resistance when drawing, which actually feels really nice. Though if you prefer a smoother stroke, swapping out for a different nib should help. The accuracy on the pen is darn-near perfect, though occasionally you may get some slight jitters in your lines, which usually only occurs if you draw really slowly. When you’re comparing the Windows store to the app store on the iPad, it’s a bit disappointing, though more developers are creating apps for it every day. Where the beauty of Windows does shine however, is customization. One app called Tablet Pro allows you to fully customize a UI bar full of keyboard shortcuts which easily allows you to ditch the keyboard and work on the couch. There are a wide range of specs that you can pick from, but remember that you’re running full desktop programs on here, so it might be safe to get more power and memory than you think you need. 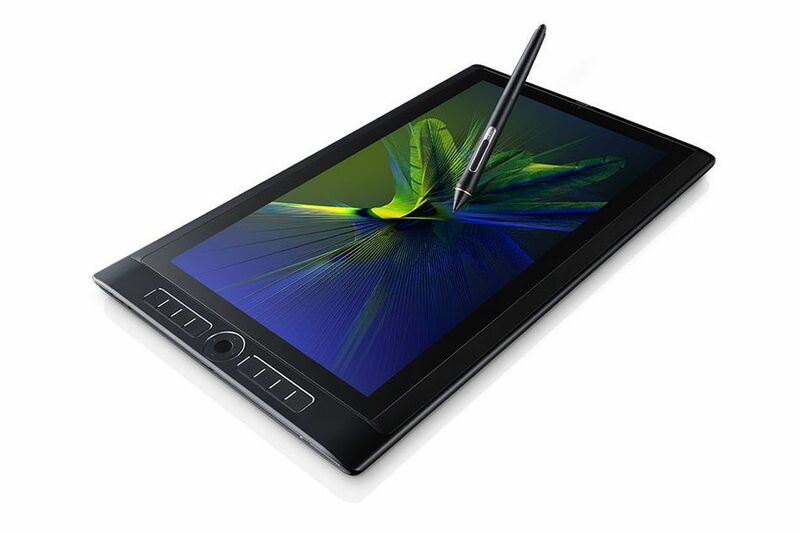 Last but not least, we have to talk about the Wacom MobileStudio Pro. Over the years, Wacom has become the go-to brand for digital drawing tablets at home but their mobile tablets are relatively new. This device comes in a 13” & 16” size, and runs full Windows 10. Artists have been working with Wacom products for years, and it hasn’t really been until recently that some people are starting to switch over to options like Surface or iPad Pro. But for some, there’s just something about Wacom products that they prefer. Drawing with the stylus on the MobileStudio Pro is a dream, and it comes with the usual shortcut buttons on the side of the screen that you can customize for each program. Where this machine shines however, is the ability to connect it to your Mac or PC and have it work just like any other Cintiq. With this feature, you can work on the go and when you return to your desk you can connect it to your computer and continue working. These machines can be pretty beefy, able to handle even hi-poly sculpts inside of Zbrush, making it a really nice portable machine for artists. The good news is: There are several different options out there, some that I haven’t even listed here, and companies are pushing each other more and more to innovate these type of devices (See the recently released HP Zbook X2). Now you should have more information to be able to decide which might be best for you.. and finally work from the couch while you watch The Bachelor with your partner.